Auto industry types theorized several months back that zero percent financing was going to go by the wayside, thanks to rising interest rates and because it’s just more expensive to offer it nowadays. That’ll change for the holiday season, reports Bloomberg, at least temporarily. 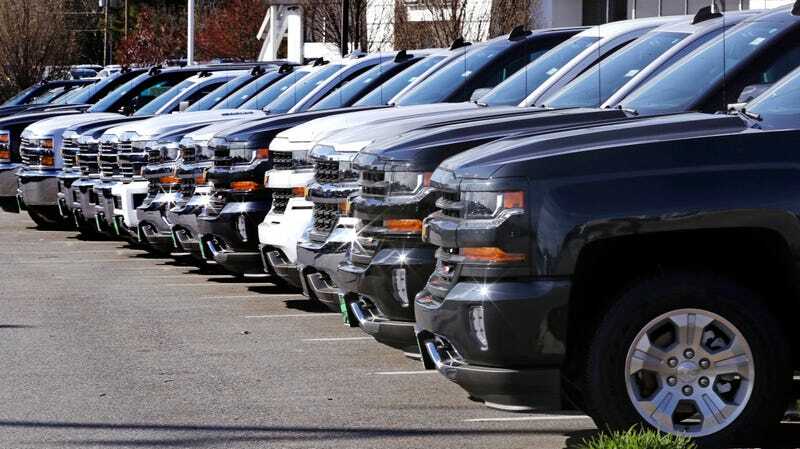 General Motors, Ford and Nissan are all offering no-interest loans this month for up to 72 months—a very long time, to be sure, but altogether the norm these days—on several vehicles, including the Chevrolet Silverado, the Ford F-150, and the Nissan Rogue, according to Bloomberg. The zero-percent deals are surprising since it’s become more expensive to offer cut-rating financing as the Federal Reserve has raised interest rates. The share of U.S. vehicle sales financed with zero-percent loans shrank to just 3.8 percent in October, the lowest in more than 11 years, according to market researcher Edmunds. GM, for one thing, seems fairly stoked about it. Besides the Silverado, it’s also offering zero percent for 72 months on the Equinox and Tahoe SUVs, Bloomberg Reports, with other Chevy models being offered for zero percent for 36 months. Yeah, baby, gotta motivate those buyers to take on a six-year auto loan for a product that rapidly depreciates from the moment it leaves the car lot. Anyway, Ford has a similar 72 month deal for a F-150, and Nissan’s offering the slightly more reasonable terms of 60 months at zero percent for the Altima, Maxima, Rogue, Murano and the Titan pickup. What’ll likely happen is that deals like this stop at the end of the year, so if you’re itching to get a no-interest loan, now’s your chance. But, please, please, don’t take on too much car just because it’s the holidays.